This year, the North Area Neighborhood Development Council completed community beautification projects, supported a number of great community events, such as family movie screenings, to reach our stakeholders, voiced our support for projects in our area that would bring more opportunities to our community – and more. NANDC was pleased to be honored at the Clean Streets LA Award Ceremony in January, where NANDC received a $2,500 grant for its efforts to address street cleanliness in the district and implement exceptional community improvement projects. 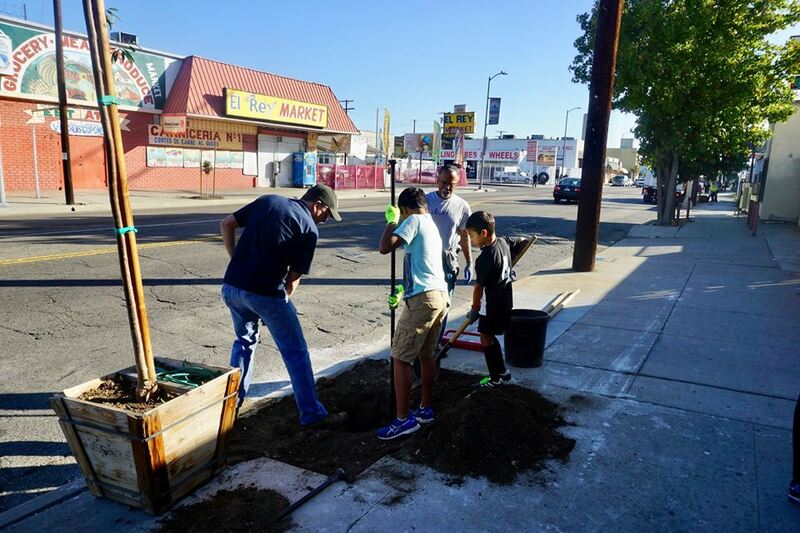 As part of Clean Streets LA, NANDC took part in several separate alley clean-ups. Over three days during the summer, NANDC board members and volunteers pitched in to remove litter, abandoned waste and bulky items from three of the most polluted alleys in the neighborhood. As part of NANDC’s outreach efforts, NANDC partnered with the Council District 8 to host “Spring into Wellness,” a free community event designed to raise public awareness of local resources dedicated to health & wellness, civic engagement, and financial literacy. NANDC dissected and spent much time reviewing the new South LA Community Plan; making recommendations with stakeholder input to ensure proper and necessary development with historic and residential protection. In order to connect more closely with the community, NANDC began a more robust and consistent social media campaign across its Facebook, Instagram and Twitter channels. NANDC formally issued its support for the Lucas Museum of Narrative Art, a project that will provide our community with greater access to the arts and educational opportunities for generations to come. Co-sponsored well-attended Movies in the Park outdoor family movie screenings along with Councilman Marqueece Harris-Dawson over the summer, providing an excellent opportunity for families to connect to their local parks. A new Starbucks location on Jefferson Blvd and Western Ave opened to the community, after input/feedback from NANDC. NANDC deployed a community survey to learn more about all stakeholders and what they feel is most important to them. NANDC partnered with KYCC and Make Jefferson Beautiful to plant 19 trees and clean and weed along Jefferson Blvd. NANDC submitted a letter to city officials regarding the FAA and LAWA’s poor implementation of NextGen. The severity of airplane noise emanating from low altitude flyovers is resulting in many quality of life issues for our community and surrounding communities. Thanks to everyone who came out to voice their concerns at our monthly meetings, attended our events and showed their support at our local community projects. Looking forward to doing even more to build a stronger community – together!